As well as collecting engagement data for sector benchmarking, our 2017 Member Engagement Survey examines the behaviours and actions of the membership organisation itself. We investigate the opportunities organisations are providing for members to input, interact and collaborate to co-create their ideal membership body. Organisations share their engagement success stories and the data they’ve collected for over 30 engagement measures, both behavioural and attitudinal. 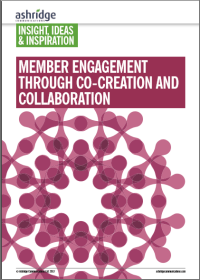 Our first survey, in 2013, investigated how professional bodies were defining and interpreting member engagement, what factors were considered important and how engagement was being measured. We also captured organisations' data for 28 Measures of Engagement and used it to provide two types of member engagement score. Report of our 2017 member engagement survey, including engagement success stories, data for sector benchmarking, and a focus on organisations working together with members to co-create and collaborate. Full report of the 2015 study, including engagement definitions, initiatives and priorities, advocacy and volunteering activities, monitoring and measuring, and Member Engagement Scores.